Exclusive Interview with Daisy Martinez! Ever since I was a little girl, I loved to watch my mother and father cook. My mother had her technique and my father, his. As I grew up, I learned to cook and became really good at it. I think its in the blood! Cooking for me is a stress-reliever and an art! I have to say that I am beyond grateful and honored to interview Daisy Martinez for My Life Simple and Beautiful. As I ask Daisy Martinez, a Celebrity Chef and Food Network star, my questions you will feel her answers coming through your computer screen as you see her bright, vivid, real, and loving personality come to life. “A Brooklyn, New York native born to mainland Puerto Rican parents, Daisy Maria Martinez lived at her grandmother’s house until she was almost five years old. Between her grandmother, Valentina, and her mother, Conchita, Daisy learned that the kitchen is the happiest room in the household, filled with love, family, and delicious food. With an extended family of relatives from Central America, Spain, and other parts of the Spanish-speaking world, Daisy grew up appreciating the diversity of Latin cuisine. While attending Long Island University, she met her husband, Dr. Jerry Lombardo. After marrying, Daisy dedicated herself to raising her family, for whom she often hosted festive and gatherings featuring delicious food – a tradition that she happily continues to this day. As a surprise birthday gift, Daisy’s husband sent her to cooking school – a dream that Daisy had always wanted to pursue. In 1998 she matriculated at the French Culinary Institute, where she won first prize for her final project, The Passionate Palate. Shortly after graduation, Daisy worked as a prep-kitchen chef on the set of PBS’ Lidia’s Italian-American Kitchen, a private chef in New York City, and as the owner of a small catering business, also called The Passionate Palate . In 2005 Daisy launched her new career with Daisy Cooks! on PBS, and her cookbook, Daisy Cooks! Latin Flavors that Will Rock Your World, which was an IACP nominee and winner of the Best Latino Cuisine Cookbook in the World by the Gourmand World Cookbook Awards. As Daisy’s star ascended she met the iconic Rachael Ray at an event. This chance meeting lead to Ray’s production company, Watch Entertainment, producing Viva Daisy!, which debuted on the Food Network in January 2009. Daisy’s newest show continues her focus on celebrating life and family through food, while demonstrating her knowledge of the broad spectrum of Latin cuisine. In addition to her new TV show, Daisy is also a regular columnist for Every Day with Rachael Ray and Selecciones magazines. Intensely proud of her Puerto Rican heritage, Daisy is very active in the Latino community and with many philanthropic endeavors. To date, just a few of her honors and activities include: Latinas Unidas in Rochester, NY, and The Committee for Hispanic Children and Families; mistress of ceremonies for The American Cancer Society Gala/Brooklyn Chapter, and judge for the Street Vendor Project’s Vendy Awards; promoting more fresh food in corner stores through her heartfelt essay and recipe for the Bodega Party in a Box; working with the New York Fire Department Museum Cook-Off, March of Dimes/ Chicago Chapter, Easter Seals Miami/Dade County Chapter; and appearing at numerous career days at schools all over New York City. 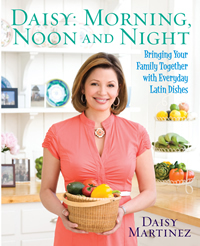 Rachel: What inspired you to write Daisy’s Holiday Cooking Delicious Latin Recipes for Effortless Entertaining? Daisy Martinez: As a working mom, and because I love to entertain, I know how stressful holiday entertaining can get to be. I put together a few menus that are perfect for the holidays (but great to use year round!) to help people like myself facilitate get-togethers this time of year…with a “Daisy” spin, of course! R: How is Daisy’s Holiday Cooking different from the holiday cookbooks out there? DM: The recipes are laid out in menus, which is not to say the recipes in the “Cozy Autumn Dinner for 6” cannot be used for any other holiday or celebration, and at the back of every chapter, I give you a do-ahead countdown schedule, so you can plan out your prep beforehand, and be available to enjoy your company! R: Where does your inspiration derive from? DM: My everyday! I travel a lot, and whenever I taste something new, I imagine how I can integrate that into my repertoire. For instance, when I visited Oaxaca, Mexico, I tasted a mole called Manchamanteles that is made with chiles and dried fruit. The very next time I served turkey (which traditionally is not eaten “whole” in Mexico, it occurred to me that instead of serving the traditional American cranberry sauce, the Manchamanteles would make a delicious option…with that Daisy spin! R: Out of all the superb dishes in Daisy’s Holiday Cooking, which one would you say you had the most fun making? DM: The Choquito! I can’t believe that it has never occurred to anyone before, but trust me, the only thing more fun than making it, is drinking it! R: How important is family support and encouragement in the life of an accomplished Latina Chef and TV star like yourself? DM: The support, love and encouragement of my family has probably been the most important element in my life. As a mother, I hold myself to a high standard, because I know I have four children that are watching me for an example. As a wife, I look to my husband to step in when I am traveling, writing, or shooting, so that the kids do not have to suffer for it. All in all, my family is my Rock of Gibraltar! R: Are any of your children following in your footsteps? DM: All of my children can cook, but none of them do it professionally. My oldest son is a captain in one of Philadelphia’s most prestigious restaurants, Le Bec-Fin, but he is still young and not completely committed to a career. R: What advice would you give an aspiring cook? DM: Don’t be afraid to experiment with new ingredients, and cook with your soul. For me, it’s very much about the love of the craft; along time ago, I cooked professionally for people that made me miserable; I promised myself when I left, that I would never cook for anyone that I didn’t love again. Cooking is too personal for me. R: Do you need to attend a culinary school to be a successful chef? What is your opinion? DM: I know many professional chefs that have no formal education, but that have worked in the industry for many years and have much practical experience in kitchens, but I think it helps a lot if you have training in culinary school. R: What is your favorite place/country in the world? DM: That is impossible for me to say! I once found myself driving down a road in Puerto Rico, that was banked on both sides by almond trees that formed a canopy over the road, and the beauty and fragrance was indescribable. That said, I was moved to tears to stand in the Sistine Chapel and look up at the works of Michelangelo, or to stand on the Sungate on Machu Picchu and send mirror signals to my sons who were at the top of Huaynu Picchu, or to climb the winding staircase in the Cathedral of La Sagrada Familia and look at the city of Barcelona laid out before me, or to see the majestic Andes while sipping wine in Mendoza, Argentina. The world is a beautiful place…I can’t get enough of it! R: What have you learned as a chef that you are able to apply in all areas of your life? DM: When I find myself stressed, I always remember something one of my chef instructors told me when a fellow student was crying over taillage…He said, “Nobody should cry over cooking! Remember, it will all be poop in 24 hours!” Somehow, that has been something that puts everything in perspective for me. 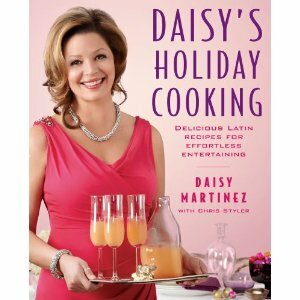 Grab Daisy’s new book, Daisy’s Holiday Cooking Delicious Latin Recipes for Effortless Entertaining, out in stores now by clicking here! Don’t forget to subscribe to Daisy Martinez’s Boricua Blog’s Newsletter. Daisy is also on Facebook and Twitter. Stay in the know and up to date with all things Daisy!